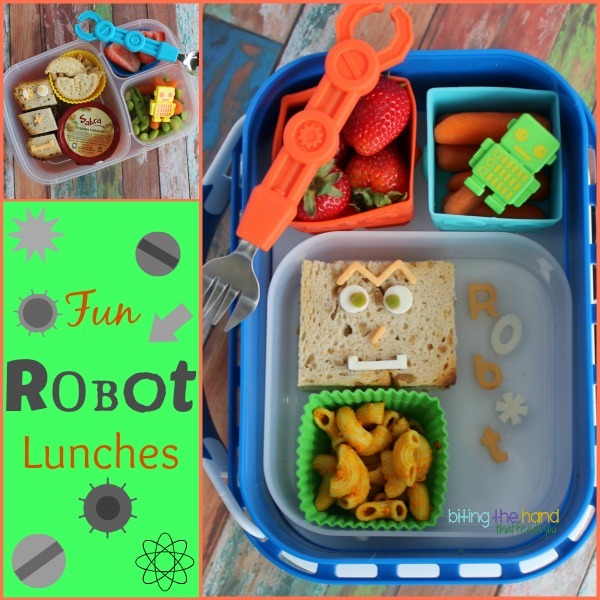 Wednesday, 10/9/13 - I've been aching to do robot-themed lunches with some fun robot-y goodies for a while now. So I finally made some for both girls! Little Sis got a very simple robot sandwich, as I hadn't really planned on doing anything with hers when I started packing. 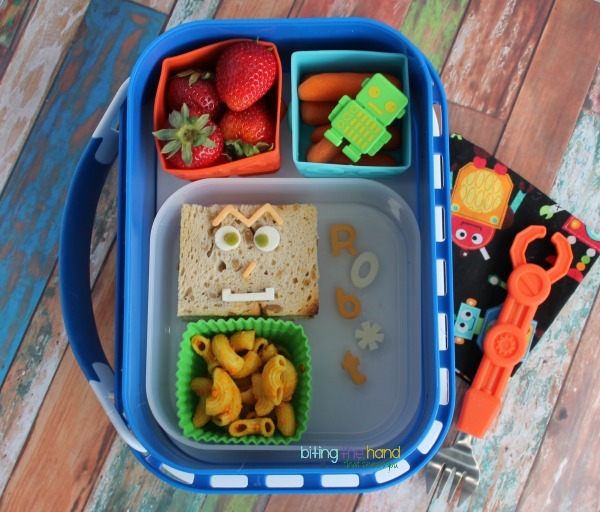 But once I was cutting shapes out of the non-dairy cheese for Z, I thought it would be fun to make a robot face on E's little sandwich fingers too. 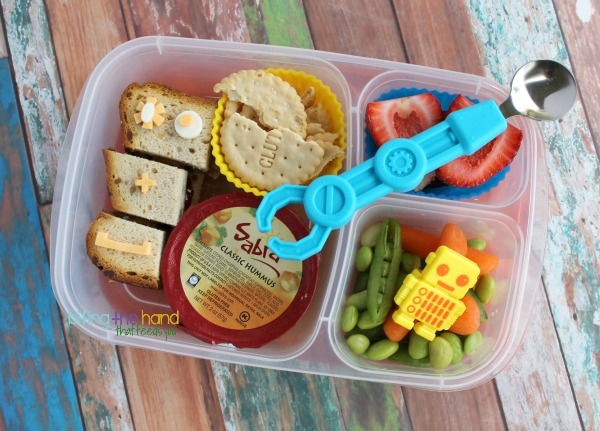 I used little cutters from the Zoku Character Kit, which is just adorable and I'd been coveting it for the longest time. She got a Chowbots spoon for her hummus, in case she didn't want to dip her broken Glutino crackers or veggies. And I added a robot cupcake topper ring for fun. 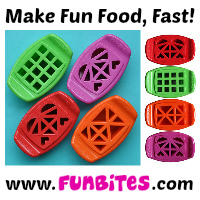 I've had the Yumbots silicone cupcake molds for a while now, but they're too tall to fit in any of my other lunch boxes. 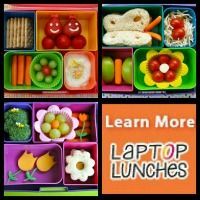 I finally thought to try them in my blue yubo lunchbox and they're perfect to sub for one (or both!) of the small round inner containers. I made the robot face using random cutters from the Character Kit, but used the Zoku Social Media Kit for the letters. Fun! Z got the Chowbots Fork for her Namaste Say Cheeze gluten- and dairy-free macaroni and cheese. I usually add some extra stuff into the sauce, like pureed squash, nutritional yeast, and mustard, to give it a cheesier taste and thicker sauce. 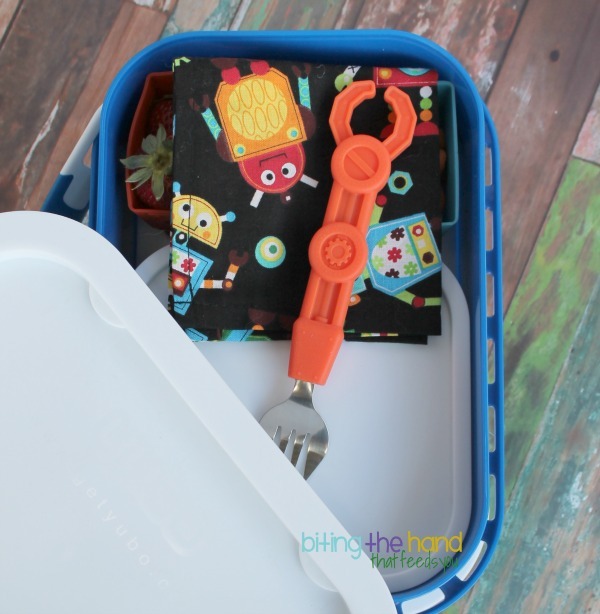 Since the tall robot cups don't have lids, I made sure to pack larger items like the strawberries and carrots, so that I could easily keep them held down with a napkin and the fork. My cloth robot napkin is from Red Poppy Crafts on etsy. 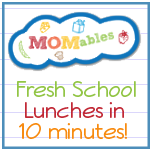 I LOVE these lunches! LOVE! 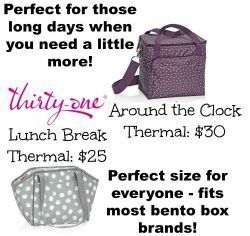 So clever and I love that everything matches! Even the utensils and the napkin!